New colours for Transport Canberra were officially unveiled with the new look blue buses and red design for the light rail vehicles on display for the public for the first time recently. One of the 20 new Transport Canberra Scania buses. "Today we showcased the first of our new Transport Canberra buses that are decked out in the new blue colour scheme, as well as the official design for the Transport Canberra light rail vehicle livery," ACT Minister for Transport and City Services Meegan Fitzharris says. "New buses entering the fleet from now on will now carry the blue livery with light rail vehicles to feature the red livery. "The two colours come as part of the new Transport Canberra branding launched in July and will form part of our new integrated public transport system. "The completion and display of the bus and light rail design is an exciting stage of the development of Transport Canberra. "The use of individual colours for different modes of transport has been used by other public transport providers around Australia and the world. As part of the showcase of Transport Canberra’s new colours, the organisation also launched the first of 20 new Scania Euro 6 buses which will be added to the ACT fleet. "These new additions will arrive in 2017 as part of our fleet replacement program," Fitzharris says. 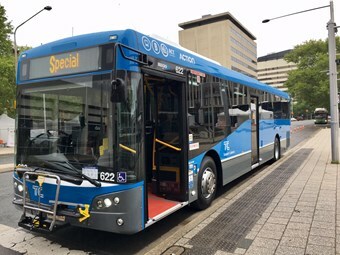 "In 2017 we will also start introducing new rapid bus services to our network, with passengers on our new routes offered a free two-month trial to encourage more people give public transport a go,"
The new buses will improve disability access for passengers, and by the end of 2017 Transport Canberra’s bus fleet will have over 80 per cent of its buses disability compliant.